Founder’s Message - What Is Well-being? Merriam Webster and Dictionary.com define well-being as a state of being happy, healthy and perhaps prosperous. The International Journal of Wellbeing describes it as “a good or satisfactory condition of existence” characterized by equilibrium or balance. The H.A.L.O. Foundation's mission is to help children with severe neurological impairment live a meaningful life, not to just “exist.” We provide opportunities and resources to individuals, families and programs to enhance daily life and help the children achieve a sense of personal well-being. The stories in this newsletter describe some of our efforts and also those of people who also strive to help children feel loved, happy and fulfilled. Thank you for your continued interest and support of H.A.L.O. What Could Be More Fun Than a Fabulous Sweet Sixteen Party? Raneisha at her sixteenth birthday party. 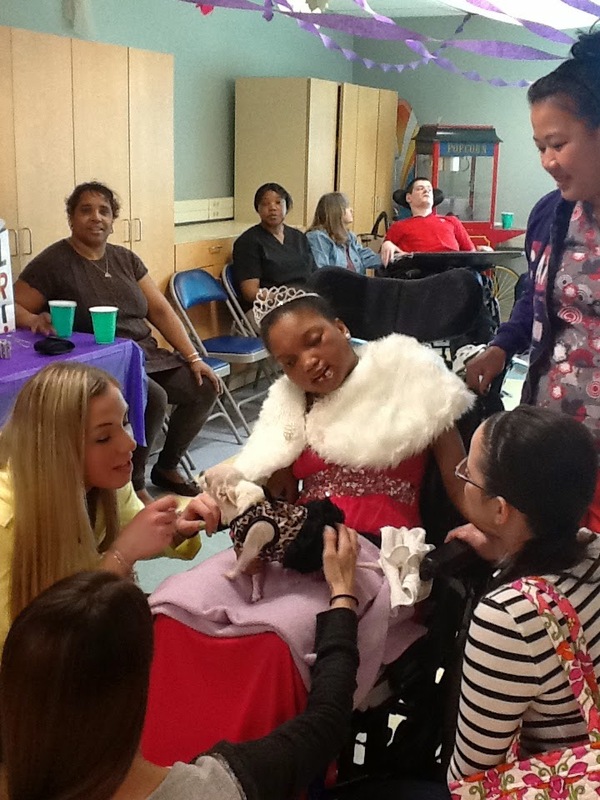 Raneisha’s Sweet Sixteen birthday party was a joyous celebration held at her home -- a pediatric nursing home. Her mother dressed her in a formal gown and guests danced to lively music in a conference room transformed into a fairyland. Her peers, family members, and the “amazing” staff that cares for Raneisha at New England Pediatric Care dressed up and brought spouses and children to share the cake and special day. Why? Raneisha and her mother Angela were struck by a hit and run driver as they walked to school one rainy morning in 2006. At first it was uncertain if the seven year old would live, but three months later doctors discharged her with severe and permanent brain damage. Rodney believes she has thrived because of the medical attention and loving care she receives at NEPC, a skilled nursing home for children who require complex medical care. Then they realized that the staff was keenly attuned to her needs and truly adored her. She wouldn’t be alone when her family couldn’t be there. The NEPC team also provided encouragement and support to help Rodney and Angela put their lives back in order after the tragedy. So on a Saturday night in March Rodney swapped his civil engineer hat for his professional DJ cap and put on a party like no other NEPC had ever seen. “Raneisha has been through so much, she deserved the best celebration possible, and what could be better than being with those who love you most,” he said. New England Pediatric Care is affiliated with the Floating Hospital for Children at Tufts Medical Center. Visit www.nepc.org for additional information. With help from H.A.L.O. it’s easier for Matt to attend his brother’s games. The Help A Little One Foundation recently contributed to the purchase of a gently-used wheelchair van for the family of Matthew D.
“Having a van that Matthew can drive onto and off in his wheelchair has enabled him to explore his world at a grander level. It’s just amazing – I can only compare it to the opportunities that became available when he first received his wheelchair,” said his father, Paul. Prior to the purchase, the family drove an older van without a wheelchair ramp. They had to transfer Matthew, age 5, from his chair to a car seat, fold and store the hundred-pound chair, drive to the destination and then reverse the process. There was limited room for passengers and the transfer was precarious and exhausting. As Matthew began to outgrow his car seat, his doctor and physical therapist expressed concerns about his safety, but car specialists told the family their van was too old to add a lift. H.A.L.O’s gift supplemented funds raised by the family’s church and community. The family also obtained a grant from another non-profit foundation. Nick in his “Elf” hat. If any parents out there need reassurance about utilizing respite services for children with severe disabilities, Janette Coombs is ready to give it. “It took an accident to help me realize these places are gifts, but now I know how fortunate we are to have Cedarcrest in our back yard,” says the Claremont, NH mom. Janette had cared for 20-year-old Nick at home ever since he was born 10 weeks prematurely with rare physical, neurological and cognitive impairments. She was driving him and his 16-year-old sister from school when Nick had a seizure so violent he broke a femur. The doctors had to immobilize him in a heavy hip-to-toe fiberglass Spica cast to promote healing. Although Nick weighs just 60 pounds, Janette wrenched her back badly while attempting to move her son in this awkward contraption. Fortunately, Nick’s doctors at Dartmouth-Hitchcock Hospital in New Hampshire referred the family to Cedarcrest Center for Children with Disabilities in Keene for temporary care. Although anxious about sending Nick away, Janette said she had no choice. The light-filled rooms, friendly staff and 24-hour nursing schedule reassured her that Nick would be safe and well cared for. This impression was reinforced during frequent visits when Nick always wore a smile. Nick returned home after ten days, but Janette says she will be forever grateful to Cedarcrest Center for helping both of them heal and for opening her eyes to respite services. For information about Cedarcrest Center, visit www.cedarcrest4kids.org. Day program participants at Plymouth Pediatric Center recently created spring centerpieces for the meal rooms at the combined pediatric-geriatric Plymouth Rehabilitation and Health Care Center in Plymouth, Massachusetts. The painted birdhouses and clay pots earned high praise from residents in the geriatric wing. 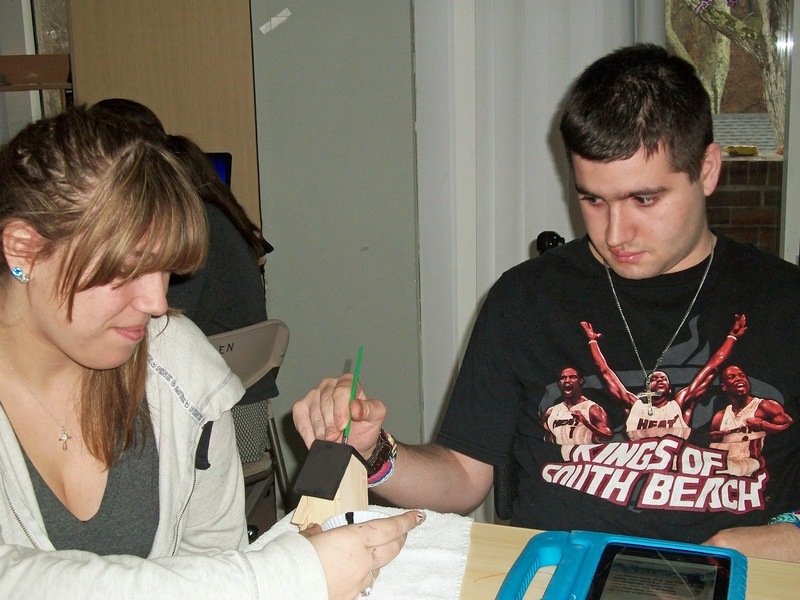 A staffer at Plymouth Pediatric Center helps a day student complete a centerpiece. “We were even asked if we would make more to sell to staff,” said Colleen Caliri, Director of Active Treatment. She said activities are designed to enrich the lives of residents, many of whom have severe neurological impairment. Plymouth Pediatric Center is operated by Athena Health Care Systems and offers a range of short-term, long-term and respite care for children and young adults with medically complex needs. Each year participants in the pediatric programs receive gifts tailored to their individual needs through H.A.L.O.’s holiday gift program. H.AL.O. recently purchased a Kangaroo Joey Enteral Pump for use in the medically-fragile classrooms in the New Bedford (MA) public schools. School Nurse Supervisor Karen Regan RN, MSN, said it saves time and makes life easier for students who cannot eat by mouth. Families are allotted just one pump, she explained. When parents forget to send it to school the nurses can use this “spare” with fresh tubing to feed students with g-tubes. “This is less stress on parents who may have to leave work to transport the pump,” Karen said. As many as 15 students require g-tube feeding in the school district.